In Biblios, players are monks trying to make the best library and the player with the most victory points (VPs) at the end of the game wins. 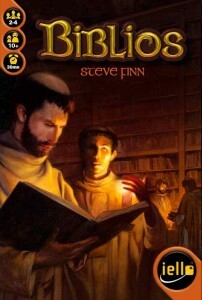 Biblios is a card game with some similarities to For Sale (as players spend the first game phase gaining cards and the second phase using those cards to get better cards) which already gives it a good start in my eyes. During the game, players gain cards of 3 different types: coloured cards (which have values on them), dice cards and gold cards. At the end of the game, the player with the highest total value of cards in each of the 5 colours scores VPs equal to that colour’s value (between 1-6 VP). However, the VP value of each colour (shown on coloured dice on the board) can change during the game because players that gain dice cards can alter 1 or 2 dice values up or down 1 or 2 points each depending upon the card.